This is cute and even cuter with a rat head under it. 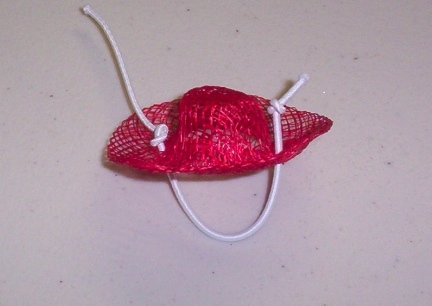 It is a rat sized and has is red and fancy, quite a Lady Rat Bonnet. It stays on the ratties head with elastic. 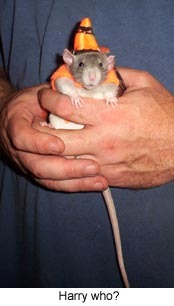 The elastic is left long when it arrives to you so that you can cut it or tuck it to fit your own rattie. This is a photo of Tamrattor, one of our own ratties, wearing his OWN HAT, just to show how adorable Ratties look wearing clothing and Hats! ALL OF THE MONEY YOU SPEND WITH US GOES TO THE CARE OF OUR ANIMALS HERE IN NW SD. MANY COULD BE CALLED 'RESCUES' WE JUST CALL THEM OURS....THEY HAVE A FOREVER HOME WITH US. We except ONLY Paypal and ship ONLY to the address on Paypal that pays for the order. And did you know that PAYPAL IS HAPPY TO TAKE YOUR CREDIT CARDS AND OR PERSONAL CHECKS? They contact us when the Check Clears and your order goes out right after we hear from them. THANKS!